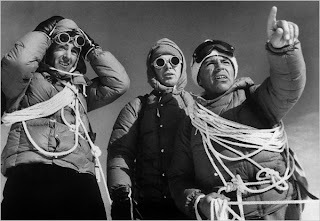 Erich Abram, Lino Lacedelli and Achille Compagnoni during the ascent of the 28,250-foot K2 in July 1954. "Achille Compagnoni, one of the first two men to reach the summit of K2, the world’s second highest peak and among the most dangerous, died Wednesday in Aosta, in northwestern Italy. He was 94."